The publishing world has changed drastically in the last few years. Self-publishing has become huge. Nowadays, many authors decide to sell their writing online in eBook form directly to their readers, no intermediaries required. If you have a strong following and awesome writing skills, becoming a best-selling author is doable even without an army of book promoters and marketers behind your back. What you need though is a great website that showcases your work and convinces visitors to purchase your musings. And we have just the suggestions to help. Here are the best WordPress themes for selling eBooks in 2016. No list of the best WordPress themes for selling eBooks would be complete without Off the Shelf. Designed to impress, this theme meets its purpose thanks to its great drag & drop page builder, WooCommerce integration, and great support. Unique designs make Off the Shelf stand out from the crowd, since it’s no secret that conversion-optimized landing pages help you turn visitors into readers. Whether you’re looking to sell a single product with a bold product landing page, build an online shop or offer your services online, Off the Shelf has your back. An online store you’ll fall in love with, Bookshelf was built to help authors sell both physical and downloadable items. It’s easily translatable, WooCommerce ready, as well as WPML, BBPress and BuddyPress compatible. You can include gorgeous sliders to dazzle visitors and customize your website with ease. Furthermore, you save some serious cash, since the theme bundles the Revolution Slider, Visual Composer, and PO Compose plugins. Not too shabby. Powerful features are what guaranteed Booklovers a spot on our list of the best WordPress themes for selling eBooks. The theme comes equipped with an intuitive visual interface, four homepage layouts, and an interactive Ajax Search mechanism. Also, Booklovers is compatible with a bundle of premium plugins: WooCommerce, Revolution Slider, Essential Grid, Visual Composer and PO Composer to make it easy for you to setup and manage your publishing company website. 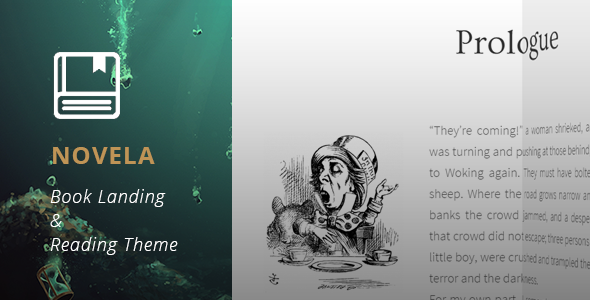 Created as a one page theme with a blog designed to help sell print or digital books, eBookie grabbed our attention due to its simple design and great functionality. The theme includes an eBook creator PSD file, so authors can design a custom book cover. It’s very easy to customize and allows you to build a modern and appealing landing page. Clean and minimalistic, Novela will help you showcase your work in a stylish and professional manner. 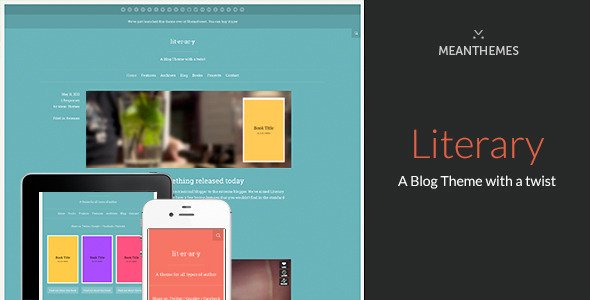 This powerful theme allows you to offer readers a book preview and easily set up downloads. It’s responsive, polished, and powerful. In short, Novela helps you promote any book, whether you want to sell it directly from your website or link to a vendor where it’s available to buy. 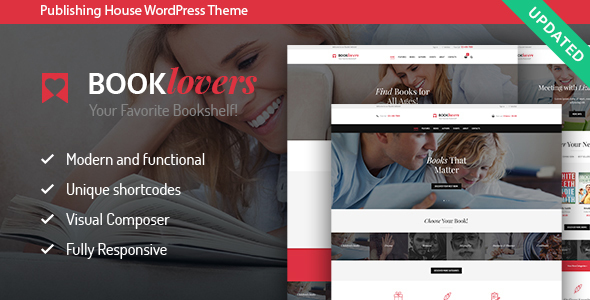 Bookish is a polished WordPress theme designed for e-book authors and marketers. In short, it includes everything you need to get your product noticed. It works great on any device, comes with four stunning skins to choose from, and allows you to easily personalize it so it completely suits your needs. Moreover, Bookish is eCommerce ready, so you can start selling your work in a matter of minutes. 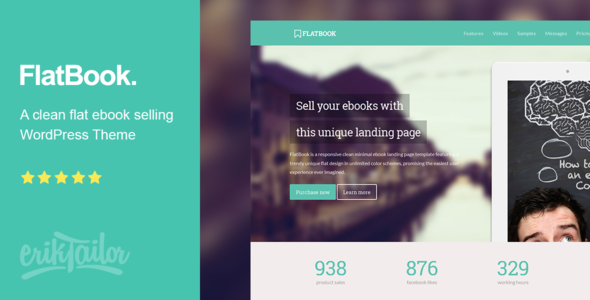 Fast and user-friendly, FlatBook is a responsive eBook selling landing page ideal to showcase and advertise your work in a clean and modern style. It comes with a suite of features that will help you create an impressive page meant to entice readers to make a purchase. FlatBook is powerful, intuitive, colorful, and sharp. 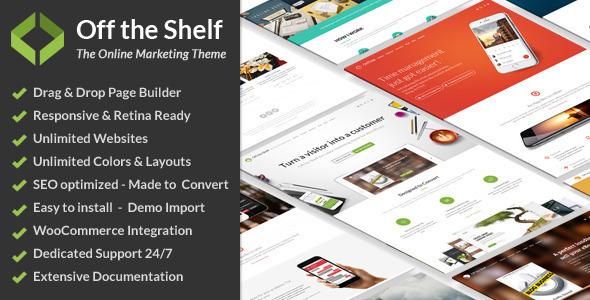 The theme offers an easy-to-use page builder, tons of customization options, MailChimp integration, and infinite layouts. 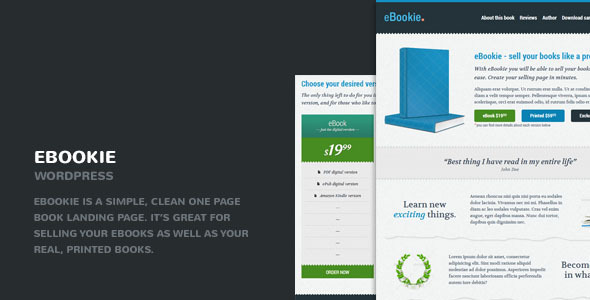 In short, one of the best WordPress themes for selling eBooks on the market. 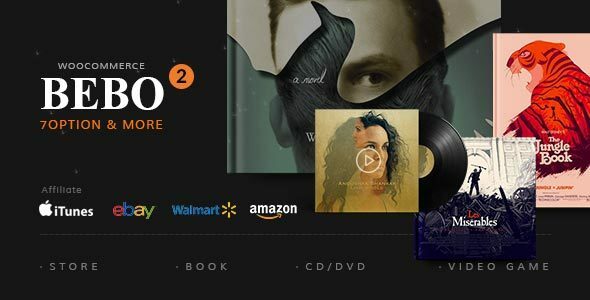 A powerful and versatile WordPress theme, Bebo is basically a store designed to promote and sell any form of media, so it’s a great choice for authors. No need to depend on other bookstores to market and sell your eBooks. The theme bundles the Visual Composer and Revolution Slider plugins, so it’s great value. Moreover, it’s WooCommerce ready – selling your work online was never easier. Last but not least, Bebo is easy to install and customize. You will be able to showcase your best work in style without too much hassle. Isn’t that the dream? Literary is slick, beautiful, and very versatile. It includes a post type for showcasing your books and a post type for your portfolio. Flexible and user-friendly, the theme allows you to add all of your books and link them to sites like Amazon and iTunes. Tons of customization options are available, so you can make your web page look and feel like your own. It’s the perfect theme for when you’re looking to keep things simple. 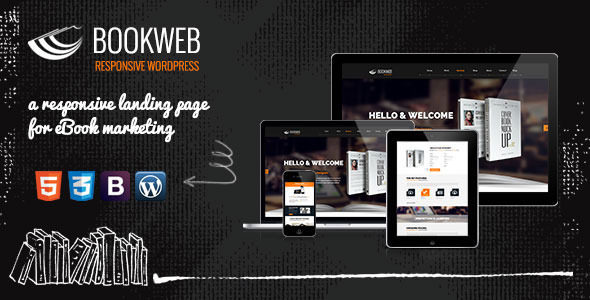 Why Choose One of the Best WordPress Themes for Selling eBooks from Our List? Besides an eye-grabbing design, the theme you pick should ideally include a built-in payment gateway to process secure payments. That way, you no longer have to manually process sales. Readers will automatically be able to download the eBook once they’ve made the payment, making your job considerably easier. Most themes on our list come with said build-in payment gateway and more. The rest send visitors to affiliate stores where they can make the purchase, so you’re covered whether you have a publishing deal in place or not. Choose any of the best WordPress themes for selling eBooks on our list and you get to enjoy plenty of features that will help you create and market your work to your target audience without breaking a sweat. No more need to hire designers and developers to do the dirty work. The publishing world is pretty competitive, so you need a website that will help you stand out from the crowd. Luckily, the best WordPress themes for selling eBooks listed above are packed with all the features required to make your publishing dreams come true. Once the writing is done, marketing will become piece of cake. @vishal – most of these themes can be used in combination with AffiliateWP or WooCommerce / Easy Digital Downloads to supplement the need for shopping cart & affiliates.